I drove a 2004 Tundra SR5 today. No SR20, the one I drove has our Chandelier company name all over it. Had to use another vehicle in the fleet, because reasons. Anyway, for more of my thoughts on this pickup, click the link below for my column on oppositelock dot com SLASH a series of words, hyphens, and then numbers. So, the short version: the 60/40 bench in the SR5 actually makes for very comfortable seats. It hugs my buns and thighs in a reassuring, yet non-sexual manner. Like when you hug one of your friends just a liiiiitle bit too long, but then you realize, meh, it’s okay. The back seems no larger than an extended cab T100, 1) because it’s effectively the successor to the T100, and 2) because the seats in the back are so nice in plush they leave little room for an actual human. Visibility is actually great. Much better than a 2nd gen Tundra 4x4, where you ride so high you can’t see any car lower than five feet tall. Is it better than a loaded T100? Objectively yes, due to the quality of fit-and-finish all the way around (early thousands... right before things started to [does nosedive motion with arm] plastic everything) but most importantly what’s under the hood - the 4.7 liter V8. Now, I love the 3.4. But on the T100 mated to an auto, it really is a dog. But this Tundra? Tons of power when you need it. Just a small application of pressure on the GO pedal, and it doth goeth. However, it is also the beginning of the trend of pickups being more than what they (once) needed to be. The backseat is downright luxurious compared to the T100. Overall, it has more of an SUV feel than a good old pickup. It just feels so much like a Sequoia with a bed, rather the Sequoia feeling like a derivative of the Tundra. A E S T H E T I C A L L Y, I like the exterior of the T100 more. But considering what a decent T100 costs these days, and how much bang you can get for your buck on one of these earlier Tundras, yeah it’s definitely an option for me in the future. 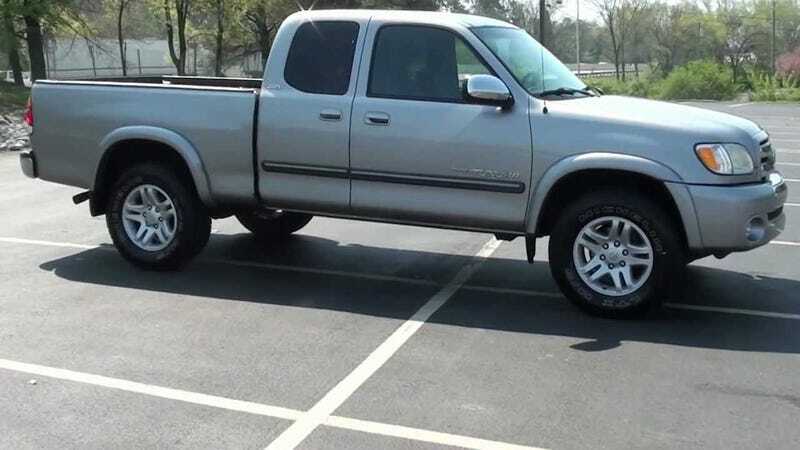 Hoping to test drive a supercharged 2003 Nissan Frontier sometime this year. Then perhaps I could make an informed decision of potential long term solutions, once I give up my pipe dream of a manual something something wagon.